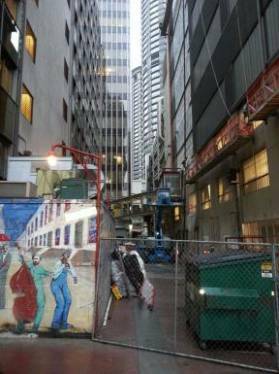 In July of 2012, Portland Bolt came to the aid of the contractor constructing a new pedestrian skybridge in downtown Seattle, Washington. The skybridge spans the alley between 5th and 6th Avenues. The area is known locally as “Jazz Alley” because for decades it has been the location of one of the West Coast’s premier jazz clubs. The job required multiple tie rod assemblies for the erection of the skybridge. 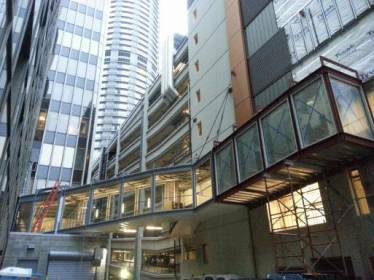 Because the project required closing down the street completely to all traffic during the erection of the skybridge components with a crane, there was a very narrow window of delivery required. 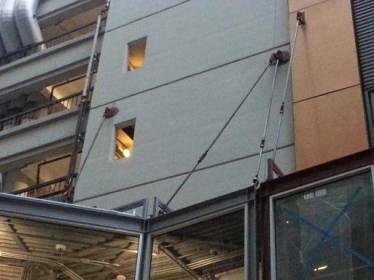 With this in mind, the steel fabricator performing the erection knew to immediately call Portland Bolt. Portland Bolt was able to rapidly provide an accurate estimate to the fabricator by utilizing our online tie rod calculator and years of experience with tie rod assemblies. The steel fabricator placed the order and it was put into production that same day. The particular circumstances of this job required Portland Bolt to not only manufacture the tie rod assemblies quickly and correctly, but to also have the tie rod assemblies specially delivered to the jobsite on a flatbed trailer before 8:00 AM the following Monday in order for the contractor to use a crane to lift them into place and re-open the street on schedule. Portland Bolt was able to arrange this special delivery and have the tie rods waiting on site at 5:00 AM when the fabrication crew arrived. Consequently, the contractor was able to complete the project on schedule. From the time of the contractor’s first call to Portland Bolt until the tie rods were delivered on site fully assembled and ready for installation was only 6 working days! With our 100 years of manufacturing experience, the contractor knew that he could rely on us to provide the tie rods correctly and that the order would arrive on time. Do you have a project with a time critical delivery schedule? Contact one of our experienced estimators today to discuss how we can help you out!